Pima County jail officials now let U.S. immigration officials know when they are going to release someone with a federal warrant. If ICE wants to pick up that person, it needs to do so in a matter of hours. Corrections officer Alyssa Burgos is above. Photo by Mike Christy/Arizona Daily Star archive. A new federal program designed to deport serious criminals or those who pose a threat to public safety is already having an impact in Pima County and Arizona — even as it is being rolled out nationally. In the midst of court rulings and a refocus on deporting dangerous criminals in the country illegally as they are released from jail, local Immigration and Customs Enforcement officials are detaining fewer newly released inmates overall. 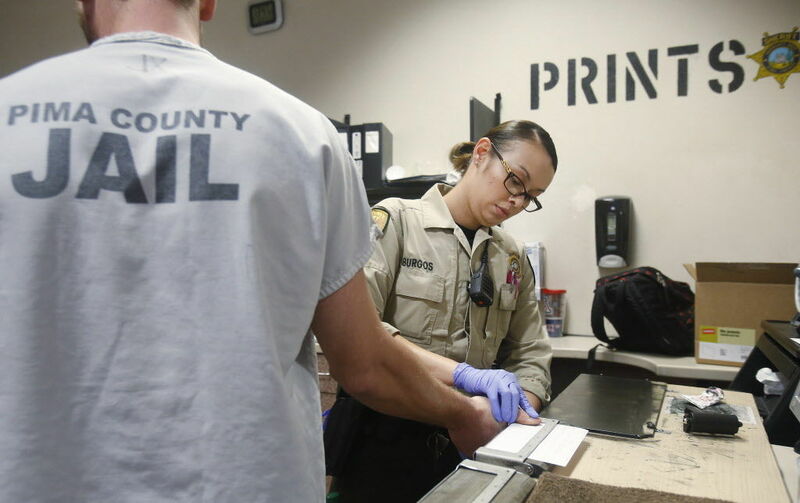 The total number of people released to ICE from the Pima County Sheriff’s Department is down 20 percent from 2012 to 2014, while the average jail population in Pima County has decreased about 7 percent. Under the Priority Enforcement Program, which Homeland Security Secretary Jeh Johnson announced in November, instead of immigration officials asking local jails to hold persons of interest for up to 48 hours, they will now request they be notified before their release in most cases. The change is part of the dismantling of the Secure Communities program, which had the same goal as the new effort but was widely criticized for sweeping up minor offenders or those charged but never convicted of a crime. It was also subject to lawsuits claiming it violated the Fourth Amendment. “Its very name has become a symbol for general hostility toward the enforcement of our immigration laws,” Johnson wrote in a Nov. 20, 2014, memo announcing the new program.